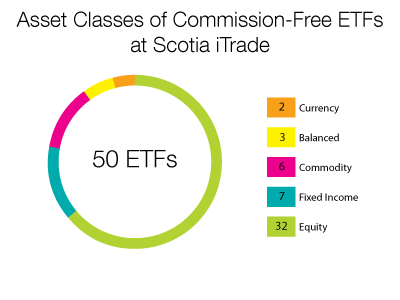 As mentioned earlier, Scotia iTrade’s commission-free ETF list contains 50 funds investors can choose from, 30 of which are also offered by Qtrade and Virtual Brokers. In fact, there are actually only 7 ETFs that Scotia iTrade offers commission-free that aren’t offered commission-free by one of their competitors. One interesting feature of the Scotia iTrade group of commission-free ETFs is that 4 of them are currency hedged to Canadian dollars. As the table below shows, Scotia iTrade only offers funds from four ETF providers compared to 5 at Qtrade and 18 at Virtual Brokers. The concentration of providers is clearly skewed towards the iShares line of ETFs with Horizons funds contributing the next biggest portion of ETFs. Conspicuously absent from the requirements is a minimum purchase amount, which is positive for anyone looking to purchase small amounts of particular funds at any one time. There is a note for users of the pro platform that commissions will be charged for orders placed through the platform and later refunded back to the user. For the full list of eligibility criteria for commission-free ETF trading at Scotia iTrade, click here. In the final part of this series, the plans from Virtual Brokers and Questrade will be looked at in detail and we’ll wrap up with the lessons learned from researching the various commission-free ETF offers.